When Albert Balch, the developer of the Wedgwood neighborhood, put up stone gateposts at the entrance to his new housing area, he tapped into the gateposts’ symbolism of permanence and protection, qualities desired by young couples in search of homes. Balch was aware of and interested in his family history. He knew that he was descended from John Balch who had come from England in 1623 and settled in Beverly, Massachusetts, near Salem. Today the John Balch house is one of the oldest wood-frame houses still standing in the USA. Albert Balch named his eldest daughter Beverly and he was proud of his early-American ancestors and their accomplishments. In addition to New Englanders of the 1600s like John Balch, Albert Balch knew that in the 1800s his relatives had been active pioneers and town-founders in the Puget Sound region. Lafayette Balch, his great-great-uncle, was one of the founders of Steilacoom, Pierce County, in 1851. Balch’s original stone gateposts at NE 81st street were refurbished by the Wedgwood Community Council in 1995. When Balch and his business partner, Ralph Jones, started the View Ridge development in 1935 they added sections a little at a time, buying more land as they were able. View Ridge homeowners were required to have an architect design their homes but not in any particular style, which resulted in a neighborhood of well-designed homes but no over-all consistent look. In July 1941 Balch platted a forty-acre section of land with a plan to develop it all together, instead of piecemeal as had been done in View Ridge. Balch chose the well-known architectural firm of Thomas, Grainger & Thomas to create houses in Cape Cod and Colonial styles, with enough changes of exterior design details so that the houses in the Wedgwood plat would be varied but harmonious. The overall effect would be that of a New England village. 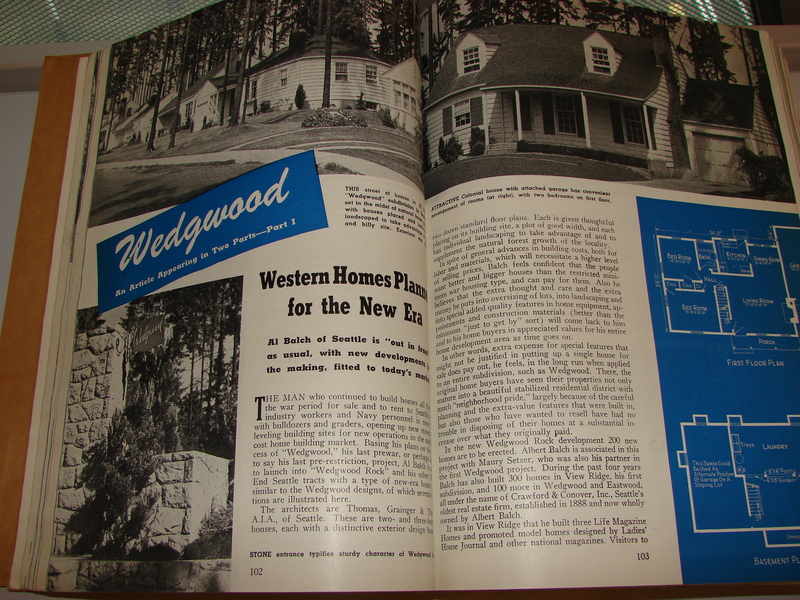 Balch’s intention to create a housing area with English flavor may have helped give his wife Edith the idea for the name she chose for the development: Wedgwood. Edith was an admirer of the work of English potterymaker Josiah Wedgwood. While most people think of Wedgwood as dinnerware with the distinctive blue color created by Wedgwood, it is likely that Edith was alluding to Josiah Wedgwood’s fine craftsmanship in all that he did. Gateposts can serve the function of both welcoming and keeping out, suggesting a borderline and that one is entering the driveway of an English country estate. To a person returning home at the end of a long day’s work, a gatepost can signal the moment of arrival, day’s journey completed. The gateposts of the original Wedgwood housing development also served a practical need, to highlight the entrance at NE 81st Street on the west side of 35th Ave NE. Balch put a screen of trees along 35th Ave NE and having gateposts at NE 81st Street made the entry more visible. The brick pillars on NE 86th Street at the corner of 30th Ave NE mark the entrance to Balch’s Wedgwood #4. 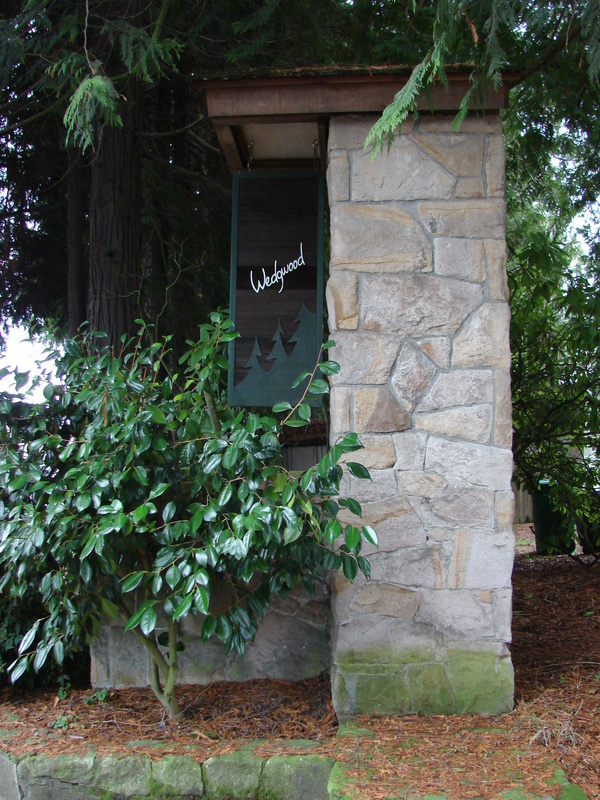 On 30th Ave NE at the corner of NE 86th Street, more brick pillars mark the entrance to Wedgwood #4. After Balch had already started building houses in Wedgwood #4, the Seattle School District came and took a chunk out of the plat for the new Wedgwood School. Instead of the brick pillars marking the entrance to a Balch development, they now seem to stand sentry at the corner of the school playground. Balch’s gatepost strategy became a signature of his developments and he continued it as he added more sections of Wedgwood housing. On the east side of 35th Ave NE, Balch put up brick pillars at NE 82nd Street to mark Wedgwood #2 from 82nd to 85th, and Wedgwood Park from 80th to 82nd. 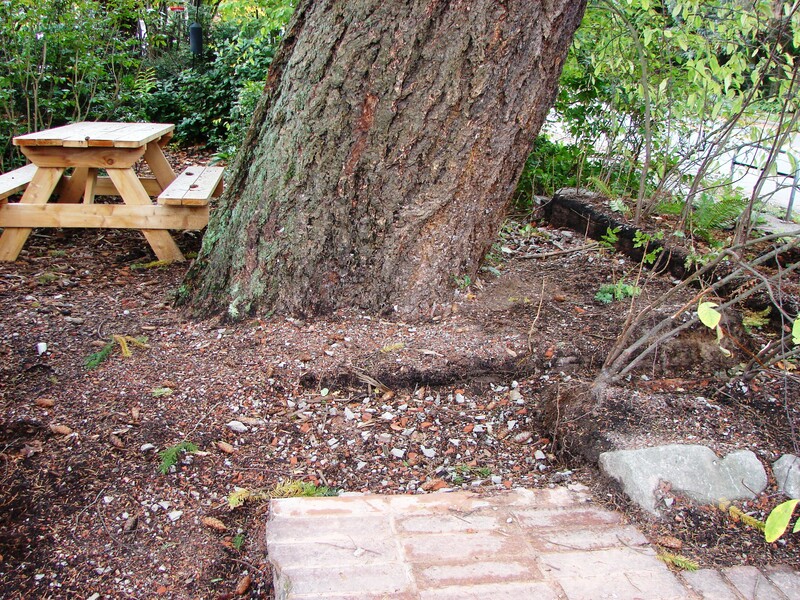 At the Seattle Audubon Society office on the southeast corner of 82nd and 35th, we see the platform remaining where the brick pillar was removed. 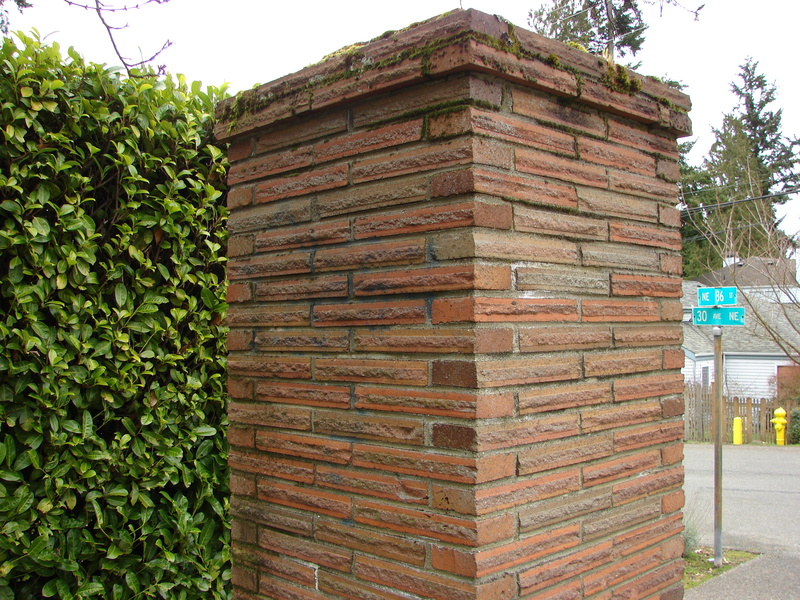 UPDATE: One of Balch’s brick pillars on 35th Ave NE at the corner of NE 82nd Street was removed on October 18, 2014. Located on the southeast corner of the intersection, the Seattle Audubon Society decided to remove the pillar because it was deteriorating, was often tagged with graffiti, and the pillar and its brick wall closed in the corner and made it dark. Removing the pillar and wall has opened up the corner to make the office more visible. In future the Seattle Audubon Society & Nature Shop may put a sign there at the corner, which would help drivers on 35th Ave NE more easily find the office. The Seattle Audubon Nature Shop at 8050 35th Ave NE in Wedgwood., is in the former office of Albert Balch. The Seattle Audubon Society office and Nature Shop at 8050 35th Ave NE is in the first office building which Balch built for his Wedgwood Corporation. Later he expanded and used office space at 8044 35th Ave NE. The 8044 building, which was demolished in August 2018, had a C-shaped sign in front, which originally said “Crawford and Conover,” the name of the real estate arm of Balch’s construction business. On the northeast corner of the intersection of 82nd and 35th, there is another brick pillar, the remaining twin of the one which was on the Audubon site. This pillar was placed as a marker pointing the way to Balch’s Wedgwood housing developments on the east side of 35th Ave NE. The northeast corner property is a shopping area owned by the Wes Williams Corporation. The site includes QFC, the Wedgwood Broiler, Homestreet Bank and other stores. Balch placed gateposts at NE 82nd Street to show the way to Wedgwood housing developments on the east side of 35th Ave NE. The original Wedgwood tract is directly across 35th Ave NE on the west side. Photo by Valarie. This entry was posted in Balch, gateposts, Neighborhood features and tagged Neighborhood History, Seattle. Bookmark the permalink.